(CNN) - Former GOP presidential candidate Jon Huntsman has some tough words for his party as they approach negotiations with the White House to avert the "fiscal cliff." "In my party, compromise cannot be seen as analogous to treason, which it has been recently," Huntsman said in a recent interview with The Huffington Post published Wednesday. He was criticized by more conservative Republicans for his comparatively moderate positions during the presidential primary. Meanwhile, he criticized his GOP opponents for not supporting a 2011 deal which eventually passed Congress to raise the nation's debt ceiling. The U.S. credit rating was eventually downgraded after the debt limit standoff in Washington. He and his rivals all raised their hands at one debate saying they would turn down a deal that included a ratio of $10 in spending cuts to $1 of tax increases. That was "pretty much the low point of (my) campaign," he said in the interview. Huntsman dropped his presidential bid long before the fiscal cliff became the issue it was in the final weeks of the campaign. Lawmakers are currently presented with the challenge of averting a plunge off of the cliff - a combination of tax increases and spending cuts that economists say would drive the U.S. economy into recession - in the new year. In an October interview with CNN's Wolf Blitzer, Huntsman described the debate stage moment: "When you were asked just to raise a hand, you don't have any chance beyond that to explain it. It does put people in an awkward position. And, of course, your knee-jerk reaction, Wolf, is to say, 'I don't like tax increases, I'm not going to allow tax increases, just like when I was governor (of Utah).' "
His advice to the GOP regarding the fiscal cliff negotiations: "You will have to have some compromise built in, and perhaps even on the marginal rates going up for a certain income category." "My going-in position would be: Let's work on phasing out all the deductions and loopholes. There is a trillion dollars there. Let's see where that leaves us and move forward before you start willy-nilly raising taxes." His presidential primary platform included a flatter tax structure with fewer deductions and only three tax brackets. Since exiting the presidential field, Huntsman has pushed at the Republican Party, including his decision not to attend the convention in Tampa because Republicans were not focused on what he called at the time a "bigger, bolder, more confident future for the United States – a future based on problem solving, inclusiveness, and a willingness to address the trust deficit, which is every bit as corrosive as our fiscal and economic deficits." In the interview, he also offered his thoughts on other ups and downs of the campaign. Prompted by businessman Herman Cain's rise in the polls, Huntsman said, "It wasn't a period where rational thinking or any kind of commitment to reality or truth or optimism necessarily prevailed.... It was how can you eviscerate the opposition." Without naming any particular candidates, he said he once looked around the debate stage and thought, "the barriers of entry to this game are pretty damn low." It would be great to see this guy pull together the best of both parties and start a real Independent party. The wings have to much control of the parties and make it so tough to govern. I like most of what he say and hope he is around in 2016. The Democrates and Republicans need to realize that not only lazy people are a problem in this country, but "job creators" are as much or more of the problem with all the fraud and waste they steal. The majority of both are hard working people, but the few from both ends cost us terribly. I really wish this guy had won the nom. Oh well. 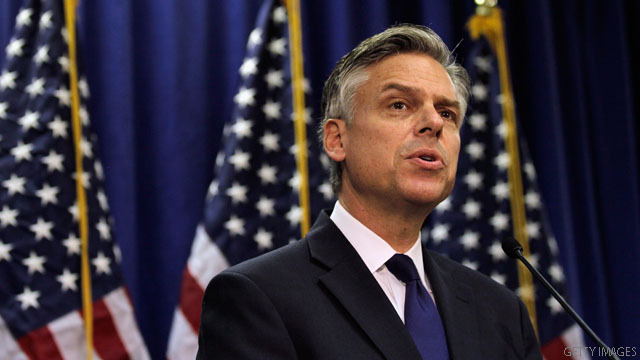 Obama should nominate Huntsman as the next Secretary of State when Hillary Clinton retires. He absolutely has the credentials and intelligence to do the job. jkane sfl gop mascots the blubbering slobs allen west rover nitwitquest rick scott ,carl rove and donald dump ?????? Romney lost because he is a three time loser for political office and a lier and tax cheat and signed the pledge to a private lobbyist rover norquest and would have been the first president to do so along with lyin Ryan , nobrainer!!!!!!! !